Artst Titus Kephar believes the U.S. prison system is part of the problem it seeks to correct — not the solution. 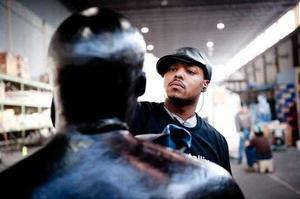 He addresses this issue in artistic ways and his work is being recognized by major institutions. In June 2016, Kephar was awarded an Artist as Activist Fellowship by the Rauschenberg Foundation. Kaphar's incarceration-themed Jerome Project was exhibited at The Studio Museum in 2014-2015. 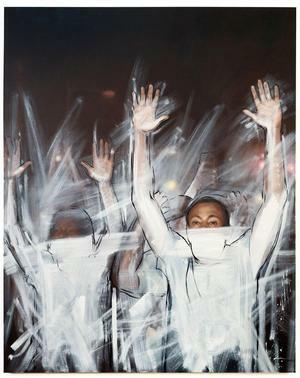 In December 2014 TIME magazine commissioned Kaphar to portray the Ferguson protestors who collectively were chosen as one of four runners-up for TIME's 2014 Person of the Year. 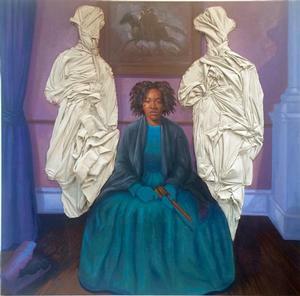 Titus Kaphar initially became well-known for developing a style of history painting based on formal conventions of traditional European art and incorporating transgressive elements such as black figures and cut-outs revealing empty spaces behind painted surfaces. But reckoning with his father’s imprisonment led Kaphar onto a new path with The Jerome Project. While searching online for for his father's prison records, Kaphar found 99 recently incarcerated black men who shared his father’s first and last name. He painted portraits of all of these "Jeromes" based on their police mug shots and covered a portion of the paintings with tar to represent the percentage of time the men were imprisoned. Kaphar believes that policing and incarceration are used to deal with situations that have much deeper roots. However he had doubts about his ability to adequately address the issue through art. “I’ve been trying to make paintings that speak to the gravity of the situation," he told Time when he accepted the commission. "Honestly, it feels beyond me. What I make ends up feeling more like catharsis than communication." However he soon found a way to go beyond carthasis and act on his convictions. In 2015, Kaphar collaborated with curator Sarah Fritchey at Artspace in New Haven on organizing exhibitions, information resources, a conference and other public events on criminal justice issues such as patterns of racial disparity in the U.S. criminal justice system. The Artspace effort included Kaphar's work with 18 New Haven public high school students and two theater artists to create new work inspired by The Jerome Project. An exhibition of the students’ work accompanied Arresting Patterns: Race and the Criminal Justice System, a group show at Artspace by noted artists including Kaphar. The conference, "Arresting Patterns: Perspectives on Race, Criminal Justice, Artistic Expression, and Community," was co-sponsored by Artspace and the Yale University Art Gallery and held at the Art Gallery, September 12-3, 2015. The conference brought together artists, policy makers, journalists, scholars and activists to discuss topics such as the unintended effects of incarceration on the families of prisoners and “decarcerating" the nation. While all of the conference participants held progressive views, they occasionally expressed differing opinions in frank exchanges — for example, on whether negative information about victims of police violence (such as Michael Brown's behavior in the store before his encounter with the police officer) should be included in media reports. And when a panel of community leaders discussed Black Lives Matter, one expressed a less unfamilar view: reflecting on his many years of public service, he recalled his disappointment about young people who didn't follow though on opportunities to improve thier lives. His advice to the Black Lives Matter activists was: expect to work for a long time and don't be daunted by occasonal, discouraging behavior of persons you seek to serve in the community. As a 2016-2017 Art as Activist Fellow, Kaphar and his community partners will employ New Haven youth to help finish The Jerome Project’s new multi-media extension. 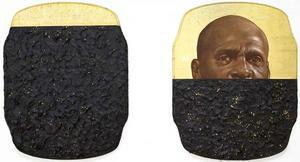 Titus Kaphar’s current art activism has not diminished his historical imagination. His Alternate Endings II, 2015 (shown at left), was at the Jack Shainman Gallery space at the Armory Show in March 2016. Kaphar’s most ambitious and intriguing historical work is the Vesper Project, a narrative and installation involving Kaphar's own memories, memory lapses and his communications with Benjamin Vesper, an imagined character suffering insanity, which made Kaphar question his own insanity. 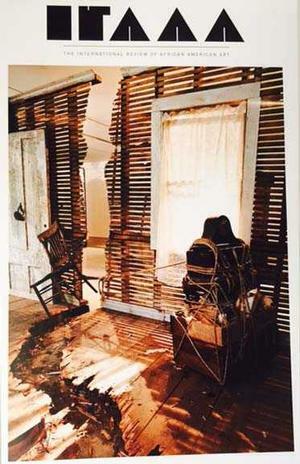 Kaphar and Ben Vesper's active engagement led to Vesper slashing one of Kaphar's paintings on exhibit and Kaphar finding and dismantling a 19th-century house which was reconstructed with additional elements as Vesper's home. The Vesper house installation was on view in 2013 at the Friedman Benda gallery in New York. Kaphar’s account of this part-autobiographical/part-fictional foray into history and the contemplation of madness is on the project site which opens to a large, blank white space. Barely discernible links to project details are at the bottom of the page. IRAAA covered the project in the "'I Mean That The Way It Sounds/Even It It Does Sound Crazy': Narration, Break and Belief in Titus Kaphar's The Vesper Project" cover story by Claire Schwartz in the Spring 2015 issue. The people involved with Titus Kaphar's New Haven community-based efforts and the 2016-2017 Rauschenberg Foundation Artist as Activists Fellows are part of a small but growing arts movement that addresses specific, criminal justice issues. All of the current Artist as Activist Fellows will examine relations of mass incarceration and racial justice. The ten Artist as Activist Fellows receive awards of up to $100,000 for a two-year project period. The awards were based on a highly competitive open call for proposals. Shontina Vernon, who works with the Visionary Justice StoryLab based on an alternative-to-incarceration program for youth. 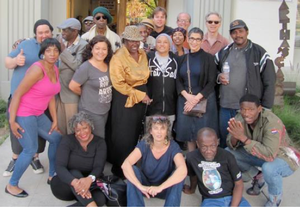 The Los Angeles Poverty Department, a political theatre group that brings arts organizations, social services, activists and improverished people together to speak out together and work towards change. The Graduates, a performance ensemble comprised of former members of the Louisiana Correctional Institute for Women Drama Club, who promote awareness of mass incarceration and racial injustice. The ten 2016-17 Artist as Activists Fellows, their backgrounds and proposed projects are listed in the Rauschenberg Foundation Award announcement.